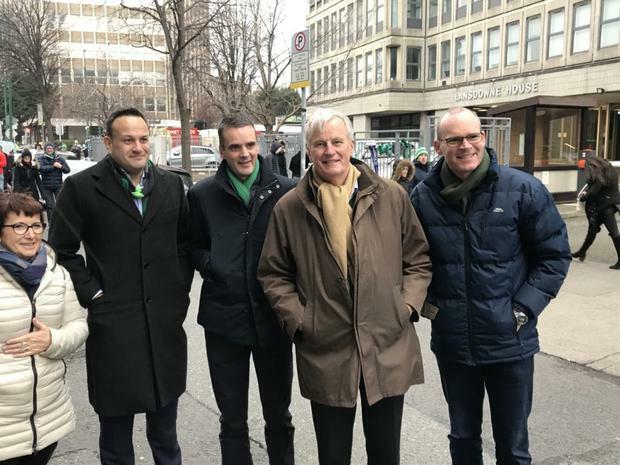 Tánaiste Simon Coveney has hit back at criticism of his "strident walk" with EU chief Brexit negotiator Michel Barnier when they attended a Six Nations rugby game last Sunday. Mr Barnier watched his native France get badly beaten by Ireland in the company of the Tánaiste and Taoiseach Leo Varadkar. Before going into the Aviva Stadium, he posed outside with the two politicians, IFA president Joe Healy and French farmers' union chief Christiane Lambert. The photograph, which was tweeted by Mr Coveney's spokesman, appeared widely in the media. The 'Financial Times' also carried a separate image of Mr Barnier inside the stadium which was captured by the news agency Reuters. But Fianna Fáil's Brexit spokeswoman Lisa Chambers criticised the jovial images at such a sensitive time in the negotiators. Speaking about how she believes the Irish Government has sought to antagonise the UK, Ms Chambers said: "Even look to Sunday when Michel Barnier arrived into Dublin and the strident walk of Michel Barnier and the Tánaiste down the street after the rugby match. That was choreographed." Ms Chambers said Irish politicians should be thinking about "the optics". Asked for a response to the criticism, a spokesperson for the Tánaiste told the Irish Independent: "Give me strength. There are important political matters on Brexit that we're focused on today and the deputy is being petty and is factually incorrect. "Michel Barnier is welcome in Dublin anytime and the Tánaiste was glad to take him to the match. "An RTÉ camera filmed Mr Barnier returning to his car and we believe in the freedom of the press to film in a public place, perhaps the deputy doesn't?"